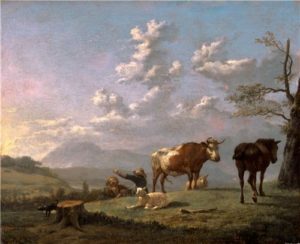 Two boys relax in the evening sun, the animals in their care arranged informally in the landscape. 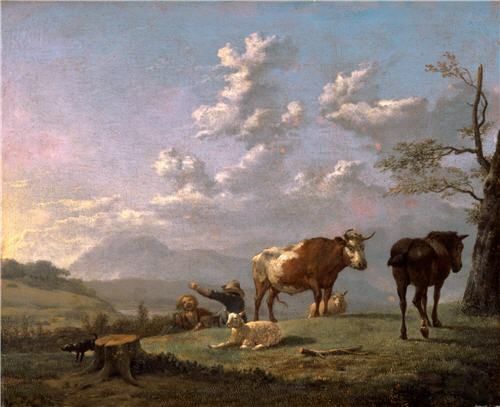 Dujardin painted numerous scenes of animals and herders travelling and resting, with a sensitive feeling for light. Here, the artist adopts a low viewpoint which leaves us looking up disconcertingly at the beasts and arbitrarily cuts off the figures. As if to emphasise the element of chance, the edge of the painting bisects the tree to the right, whilst another to the left, which might have framed the figures, is reduced to a stump.